The US meat lobby is ‘salivating’ at the prospect of flooding the UK with bacon and pork produced using practices that are currently illegal in the UK, according to an article in the Guardian. 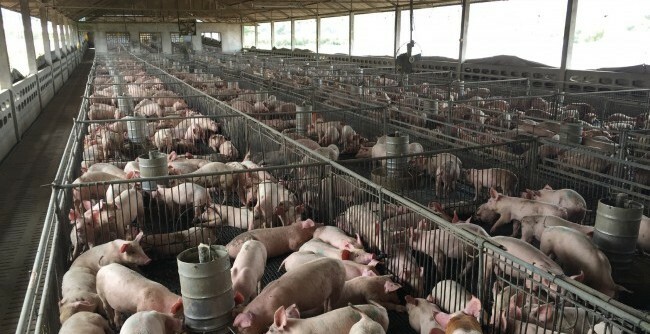 The article points out that gestation crates (sow stalls) and the chemical growth hormone ractopamine – both banned in the UK – are regularly used in the US pig industry, which achieves the lowest costs of production in the world. Any future trade deal which includes accepting US pork could potentially have a disastrous impact on the UK’s pig industry as well as diluting our welfare standards, both industry and campaigners say, it adds. Guardian journalist Tom Levitt quotes food expert Prof Tim Lang, from City University, warning that the British public needed to ‘wake up’ to the dangers of animal welfare being rolled back as the UK prepares to leave the EU. The article also highlights how the UK’s decision to take a global lead in banning sow stalls 20 years ago saw a collapse in the numbers of UK pig farmers on the back of cheap bacon from countries that had not introduced the ban, via retailers and the food service sector. UK pig meat imports from Denmark rose by 50% and from Germany by 400% between 1997-2007, according to AHDB. NPA vice chairman Rob Mutimer said a repeat of this in the form of an the influx of meat produced to lower standards from US farms would lead to a drop in wholesale prices, once again undercutting UK producers. “Our costs are vastly inflated by standards. [Unlike US pig farmers] we’re not allowed to use hormones, ractopamine or keep pigs in stalls,” he said. Animal welfare campaigners have warned that the import of ‘cheap, inhumanely produced US pork’ could see calls for UK welfare standards to be lowered and also make it more difficult to improve UK farm animal welfare standards in the future. However, Mr Mutimer told the Guardian that UK producers had no interest in lowering standards to match imports. “Having an animal that can never turn around or interact with other animals is unacceptable. I thought we had moved on as a society and that was no longer acceptable. It’s wrong to imprison them this way,” he said. Various prominent UK Ministers, including Trade and Industry Secretary Liam Fox, Defra Secretary, Defra Secretary Michael Gove and Farming Minister George Eustice have tried to reassure farmers the situation won’t arise – but have fallen short of providing the firm commitments demanded by the industry. Meanwhile, the US administration and the pork sector continue to insist the US could only contemplate a deal if the UK dropped its current opposition, as part of the EU, to use of ractopamine and other practices deployed in the US. Nick Giordano, vice president and counsel for the National Pork Producers Council, has said opposition to the use of ractopamine and sow crates was ‘pseudo-science’ and not ‘commercially reasonable’. “We’re not going to produce to perception. The food in the US is the safest and probably the best in the world,” he said.